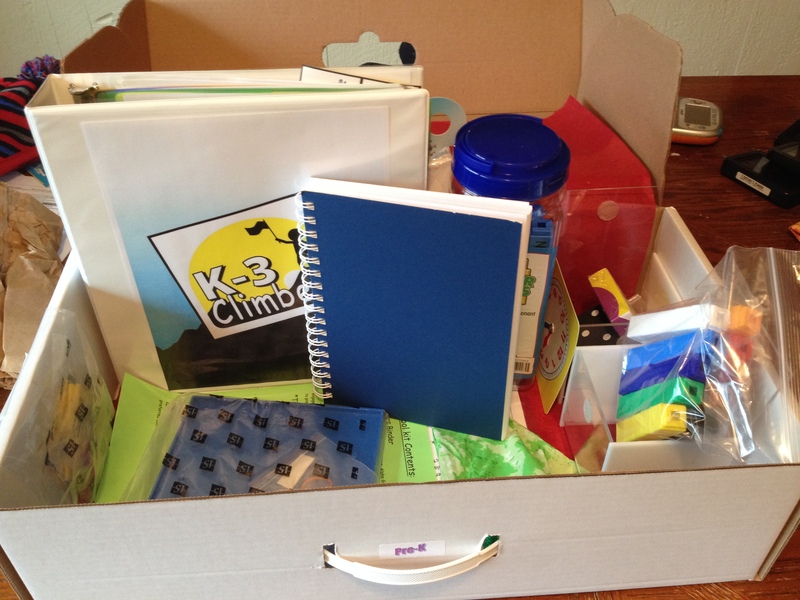 K-3 Climbers – Great Gift Idea! I don’t typically review anything that’s not book or movie related but I have something special for you. A friend of mine recently launched her own educational business (her story here) and she let me try it out and give some feedback. I admit that at first I was skeptical about it because I think of myself as a creative person and I do have a degree in education so I know how to make a lesson plan, but now that I’ve started using the kit Gage and I are both sold! This is why I think it’s a great gift idea! Sometimes moms and dads just don’t know what they should be doing to prepare kids for school. This makes it so easy! It’s a subscription service so you could just gift the kit and one month of activities and see how much the person likes it. Check out their different plans here. This is a perfect gift for grandparents to give because both grandkids and parents will benefit. Here’s the deal-You buy a kit for your Pre-K to 2nd grader (there are 2 choices) and it comes with everything you need for daily 5-10 minute learning activities for you and your child. Here’s what the kit looks like. It comes with everything you need for a month of activities and it is all planned for you and easy to use. 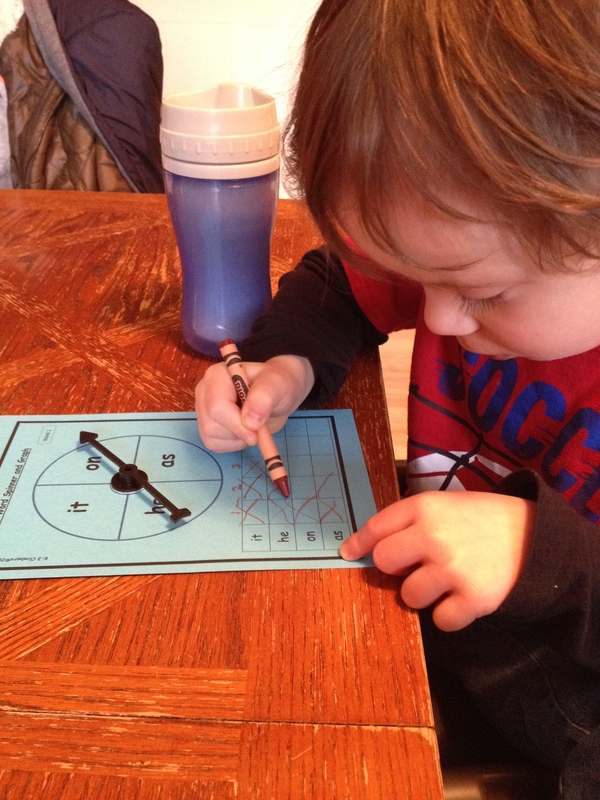 Gage liked the spinning but it was also teaching him sight words and graphing. We did this activity quite a few times. 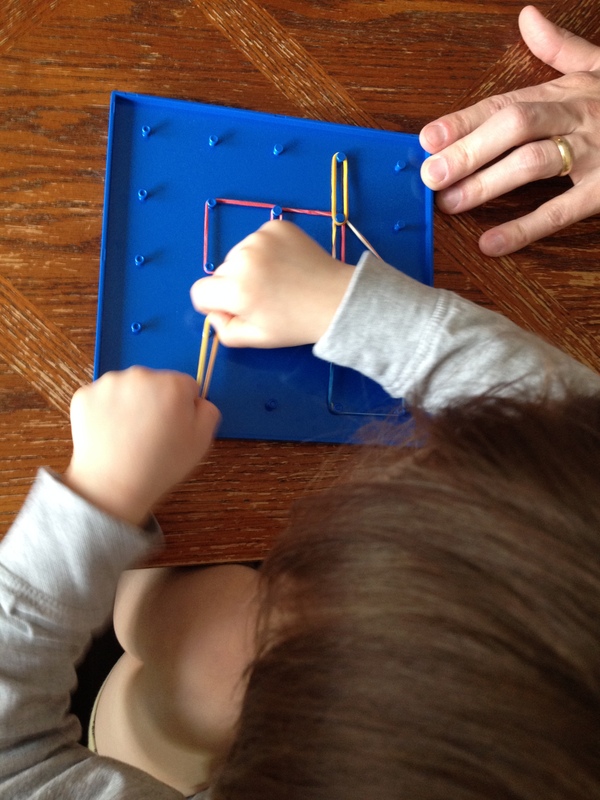 Working on fine motor skills is big around here so this was perfect. Some of the activities I’ve made harder for Gage, like this one. 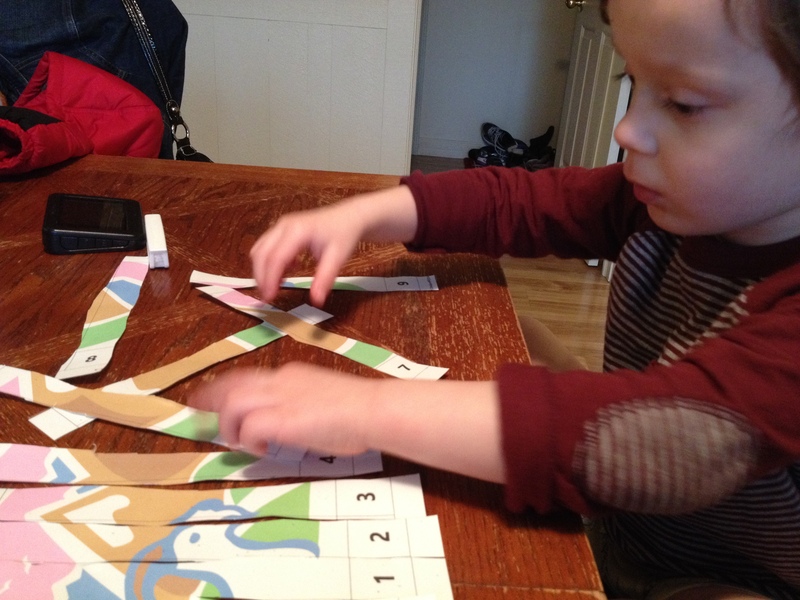 He cut the strips for the puzzle himself and then used the numbers to put it back together. 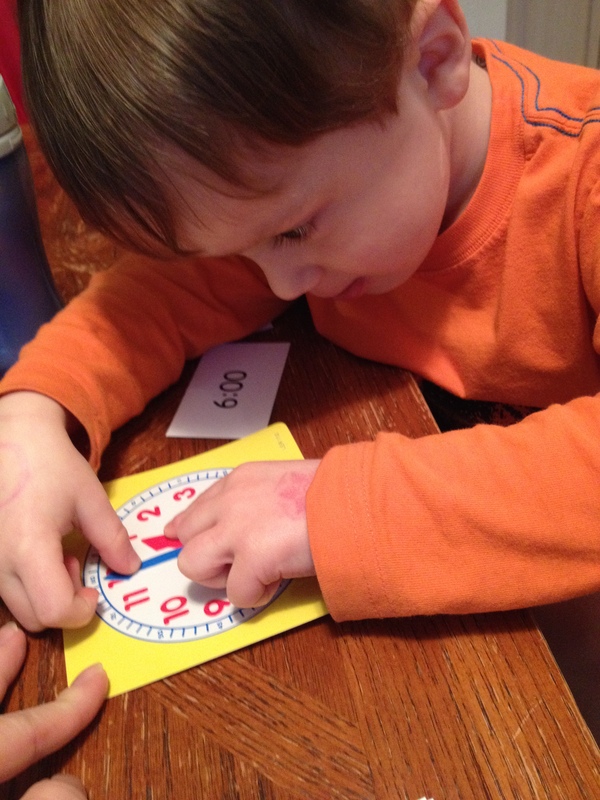 Telling time, learning about the small and big hands on the clock. I was amazed that once I explained the concept of the ‘game’ he got them all right. He loves all of these activities and there have only been 2 that he had trouble completely with the concept and I’m glad. I think it’s great to encourage learning new things and to know where the problem areas are (for Gage that has been rhyming and estimating). We’re still on the first month, but I do plan on signing up for the service. It’s learning made fun and easy and it comes delivered to my door. What’s not to like? This is a really great idea! Good luck to your friend with her fledgling business and it certainly fills a void for many parents. Gage looks like he is having a blast there. Stacy, one of the great things about your blog is that you sprinkle in personal posts. 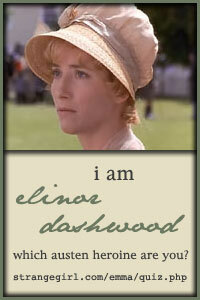 I think that makes you much more knowable and approachable. This sounds really awesome! Good luck to your friend with her business. How neat! I think my grandson would like this too! Wishing your friend much success with her business! What an awesome idea! I work with many families that just don’t know what they should be doing or what is typical! Some people are so creative. This certainly looks very educational and the kind of material that will engage curious young minds. Best of luck to your friend.